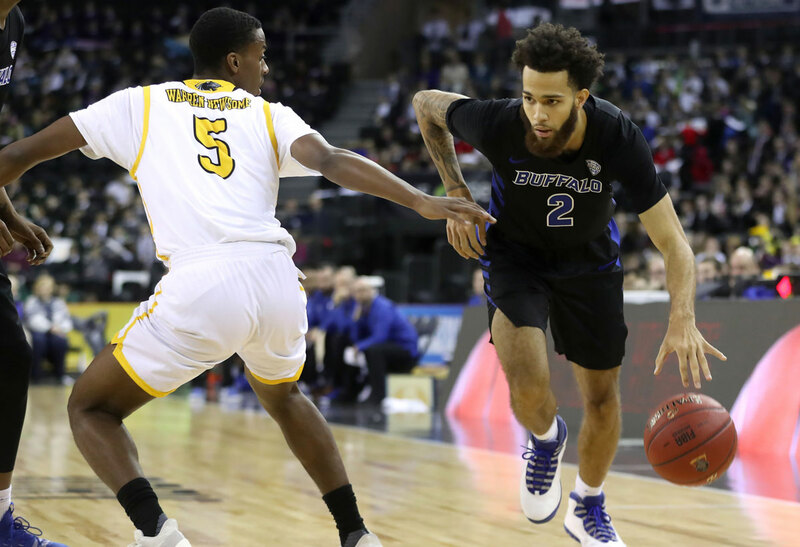 BELFAST, NORTHERN IRELAND -- The University at Buffalo men's basketball team used a 17-4 second half run on Friday morning to pull away and defeat Milwaukee in the their first game of the Belfast Hall of Fame Classic, 96-77. The Bulls, who are currently ranked #21 in the AP Poll and #20 in the USA Today Coaches Poll, improved to 6-0 on the year, only the second time they have ever started a season 6-0, and the first since 1930-31. Milwaukee never led by more than three points in the game, which occurred with 8:53 left in the first half, but a big three pointer from senior Nick Perkins began a quick 7-0 run for the Bulls as they took the 26-22 lead. The Panthers had cut it back to 29-27 when UB went on a 9-0 run, including five more points from Perkins. Senior CJ Massinburg hit a late three with 10 seconds remaining in the half, giving the Bulls the 43-32 lead into the break. Another three pointer from Perkins opened up a 16-point second half lead for the Bulls with 14:38 left, but Milwaukee had one final run in them as they cut the advantage to just four with 8:45 remaining. A layup from junior Davonta Jordan began the game-changing 17-4 run, which put the game out of reach. The run was capped off on a three from sophomore Jayvon Graves, putting UB ahead 84-67 with 5:06 left. A layup from freshman Jeenathan Williams gave the Bulls their largest lead of the game at 91-69, as he finished with nine points in the contest, including his first collegiate three pointer. "I was happy with the fight of our guys today and I think they are really starting to gel," said head coach Nate Oats. "We gave them a few more runs than we would have liked, but I really liked the response of everyone on our team. I thought today was a total team victory." Senior Jeremy Harris led UB with 21 points, going 8-of-14 from the floor, while adding four assists. Perkins added 20 points and nine rebounds, as he tied his career high with four three pointers. He surpassed Calvin Cage for 11th place on UB's all-time scoring list in the win. Massinburg added 16 points, three rebounds, two assists, three block and two steals for UB, while senior Montell McRae had eight points and 10 rebounds. Jordan and Graves each had seven points. The Bulls dished out 20 more assists, while blocking seven shots in the game. Milwaukee had assists on just five of their baskets for the game. Buffalo will have one more game across the pond in Belfast on Saturday when they face the winner of Stephen F. Austin and San Francisco in the championship game of the Goliath Bracket. That game will air nationally on CBS Sports Network beginning at 10:30am EST and 3:30 pm GMT.